From Lake Bailkal to the Altai Mountains, a wonderful set of natural attractions await you this summer. Russia’s nature reserves attract tourists from all over the world. RBTH recommends the most beautiful places in Siberia, the Russian Far East and the Caucasus to visit this summer. The beautiful reserve encompasses Lake Baikal, the world's deepest lake, and also one of the biggest sources of fresh water. The coniferous and deciduous forests of the nature reserve are home to over 300 species of animals and 80 species of plant. Some 25 of them are listed in the Red Book of Endangered Species. Rivers feeding Baikal have black grayling, lenok, burbot and taimen. Fishing is permitted, but only to an extent. 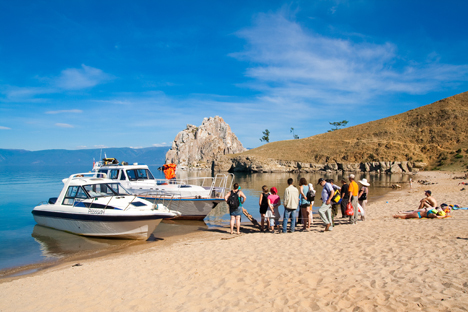 For those not fond of hiking, there are plenty of camp sites on the shores of Lake Baikal. Prices in such "tourist villages" are affordable and the locals are friendly. You can take a trip to the Great Baikal Trail. Other adventurous, if potentially foolhardy, crossing methods include kayaking, motor-bikingand skating. Located in the south of Central Siberia, the reserve features a beautiful and unique ecosystem. The valley, hemmed in by high mountain ridges, rests in pristine cedar woods cut by crystal clear, ice cold rivers, and vast deep lakes fed by glacier caps and underground water. The reserve is very popular with hikers in summer and winter alike. The hiking trails in the region are not too difficult, with many convenient well-trodden paths and shelters scattered along the route: small huts where you can put up for the night if you are not particularly fond of tents. As a rule, the distance between the shelters is equal to or less than a day's hike. The UNESCO World Heritage Site is one of Russia's largest reserves. It is almost surrounded by high mountains and borders on the great Lake Teletskoye in the south. Remarkably, there is not a single road anywhere in the reserve. The main part of the reserve is covered by wild forest, interspersed with occasional paths laid by gamekeepers. The area is home to 1,190 lakes. The Belukha Mountain – the highest peak of the Altai Mountains and Siberia, requires special equipment and prior training to climb. The mountains feature incredible views among which, as chance would have it, is the endangered snow leopard. Those who would prefer peace and quiet can find a cottage on the shores of Lake Teletskoye. For $10 a day per person, you can enjoy delicious meat roasted over the open fire and the traditional banya. For more information, go to the Altai Republic official web site. The reserve makes up one of Russia's oldest protected areas and is located on the Kamchatka Peninsula bordering the Pacific Ocean. It is home to waterfalls, the Valley of Geysers, thermal lakes and Kronotsky, an active volcano of the same name. The only geyser field area in Eurasia, the Valley of Geysers, is one of the official Seven Wonders of Russia. Its area exceeds that of the famous geyser fields in Iceland many times over. For tourist facilities, go to the Kronotsky Nature Reserve web site. Another UNESCO World Heritage Site, the reserve is located on the northern and southern slopes of the Western Caucasus. It's not far from the well-known resort, Sochi: the city draws water from rivers flowing from the Caucasian Biosphere Reserve and its vast forests bring fresh air to the city. The reserve includes part of the Caucasus Mountains, the famous permanently snow-covered Mt. Elbrus and Mt. Kazbek, each over five thousand meters high. As Europe's highest peak, Elbrus lures mountaineers from all over the world. Another sight is the largest and deepest lake in the North Caucasus, Lake Kezenoyam. Salmo ezenami, is a rare species of trout, which is native only to the lake. A special permit is necessary to visit other parts of the reserve. The permit can be obtained in Sochi at the headquarters of the reserve. The territory encompasses immense polar deserts and the Arctic tundra. Most of the year, it is covered with snow, which only melts briefly in summer. The home of polar bears is the biggest protected area in Eurasia. The swamp lies in western Siberia, between the Irtysh and Ob rivers. It is one of the largest swamps in the world and serves as a major source of fresh water for the region. Though the swamps are mostly shallow, the area does not see many tourists. The place is rife with rare species of animal and bird. The reserve was set up to preserve rare species of marine wildlife and plants. In general the area has very rich fauna, both on and below the sea surface, although many of the species are now endangered. The reserve's northern part houses a comfortable hotel offering no-frills accommodation on the seashore. To find tours check here.